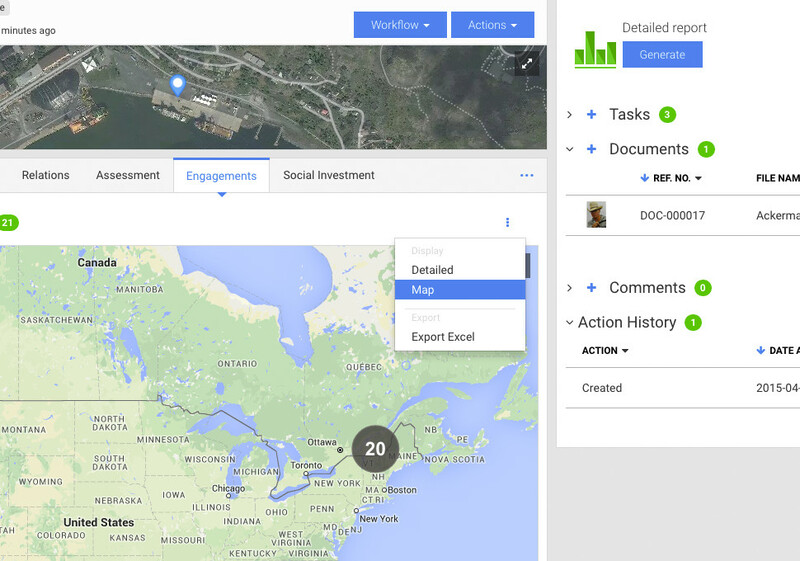 Complete Social Performance Dashboards with Maps & More! Complete Social Performance Dashboards with Maps, Graphs and More! 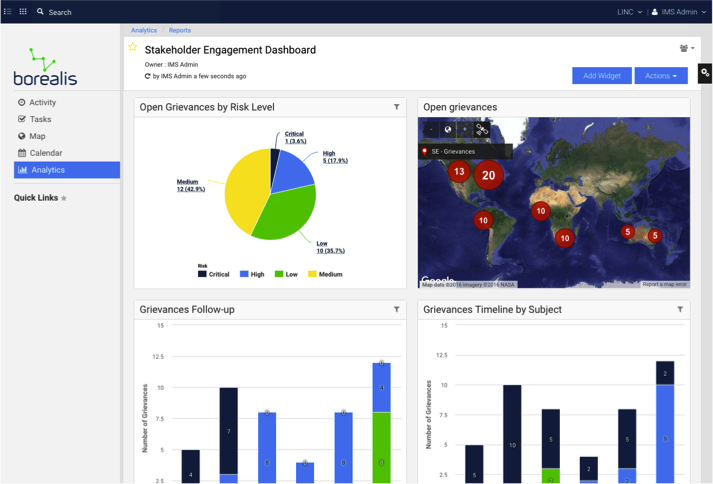 Dashboards offer a visually compelling way to analyze data and provide a comprehensive overview of complex information. We’ve been working hard to make sure our users get the most out of their data and that’s why our Analytics tool has been evolving quite rapidly over the past year. Here are some of the latest improvements to the Boréalis Application. Our mapping tool is very popular among our users, whether it’s to locate stakeholders or even identify areas of risks. As previously mentioned, Boréalis Analytics is another tool that users appreciate for its versatility and analysis capacities. Various graphs allow users to get the most of their data and gain a better understanding of their stakeholders, project status, environmental thresholds, and more. Side by side, both of these tools have great potential. Imagine the results when combining both… Well, that’s exactly what we did! Users can now customize the Maps widget and include several maps to provide a more accurate overview in their dashboards. Here’s an example of how users could use the Maps widget: creating a map of all communications related to a specific subject for a given period of time. For instance they could generate a map for all complaints related to noise over the last 3 months. Geolocation has been a core component of the Boréais App for years. It’s been useful for many purposes like localizing stakeholders such as individuals and organizations, identifying zones where complaints are increasing or decreasing, etc. Users can now benefit from an additional feature that uses geolocation: every list containing records that are geo-localized has 2 possible views, list or map. This is interesting if you’d like to know where attendees from a public consultation are from, or even for land acquisition to view all of an individual’s assets on a map (especially interesting for crops). Stakeholder Engagement can be overwhelming, especially when dealing with hundreds (or even thousands!) of stakeholders and a team with numerous members. Ever worried you never saw a task that was assigned to you or that you missed the target date of an issue? Well you can now make sure nothing falls through the cracks by setting up email notifications and reminders for yourself and your team members. Carl is Team Leader of the Product Development team at Boréalis, which he joined in 2012 as a Developer. Before joining the company, Carl was developing software to improve productivity and processes, in addition to reduce costs of operations, for large companies in the pulp and paper industry. He’s been the President of the Executive Board of 2 local NGOs for the last 15 years. When he’s not brainstorming with his team on a breakthrough for new features on the Boréalis Application, Carl is a fervent fan of his daughters’ figure skating.